I don’t know about you guys, but there are certain people in my life I just couldn’t do without. For example—-the ladies in the childcare area at the gym. Oh bless their hearts! They are amazing and although I don’t even know all their names, it’s the perfect time of year to let them know how much they’re appreciated. Enter—-homemade gifts! I whipped this Rosemary Orange Sugar Scrub up yesterday afternoon and I’ve been excited to share the recipe here with you all. It’s simple, very inexpensive and it’s not food—which some people really appreciate this time of year, with all the extra goodies already around. If you don’t have fresh rosemary growing, go ahead and buy some in the produce department at your local store. You’ll only need a few sprigs. And essential oils? Just use whatever brand you prefer. 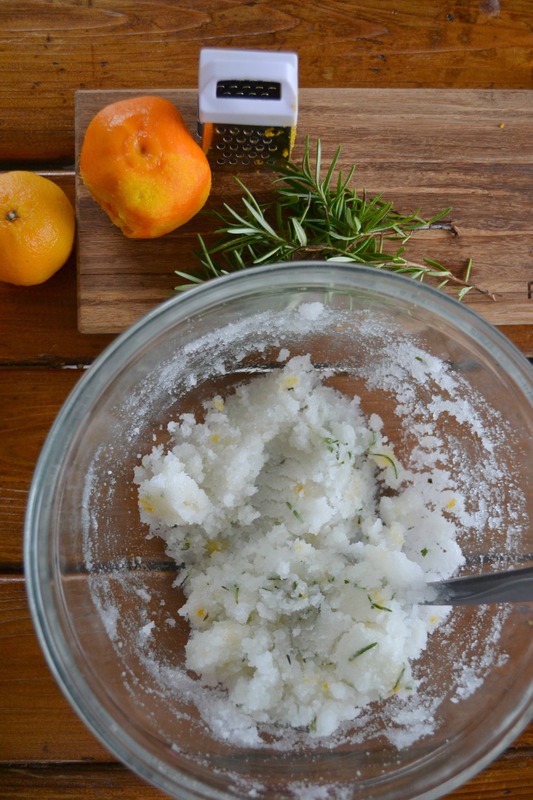 So….let’s make some sugar scrub! Start by roughly chopping the leaves off a few sprigs of rosemary. Doesn’t it smell so good? Rosemary is a fresh smell that’ll wake you right up. Next, zest the rind of one small orange. 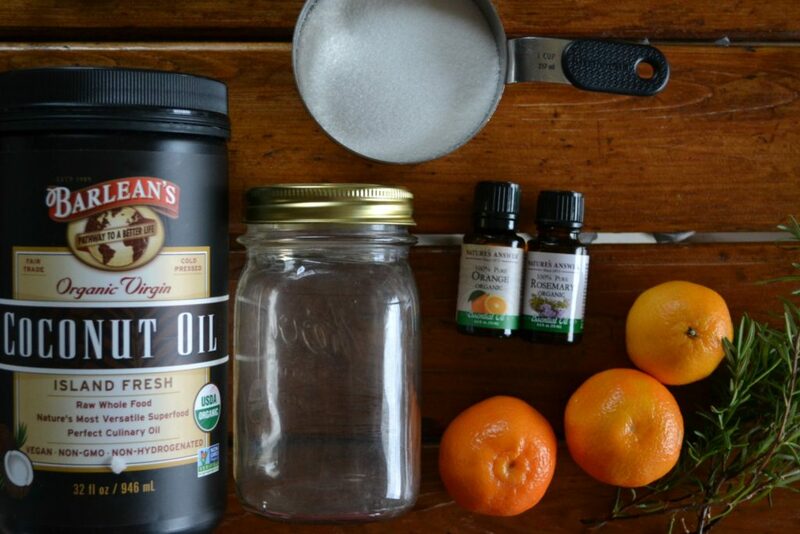 Melt the Barleans Coconut Oil, stir in the sugar, the rosemary, orange zest and a few drops of each essential oil. Go ahead and try some out on your hands. Doesn’t it smell amazing? Now you’re ready to put it in a jar! Decorate your jar with pretty paper, ribbon or a fun label. 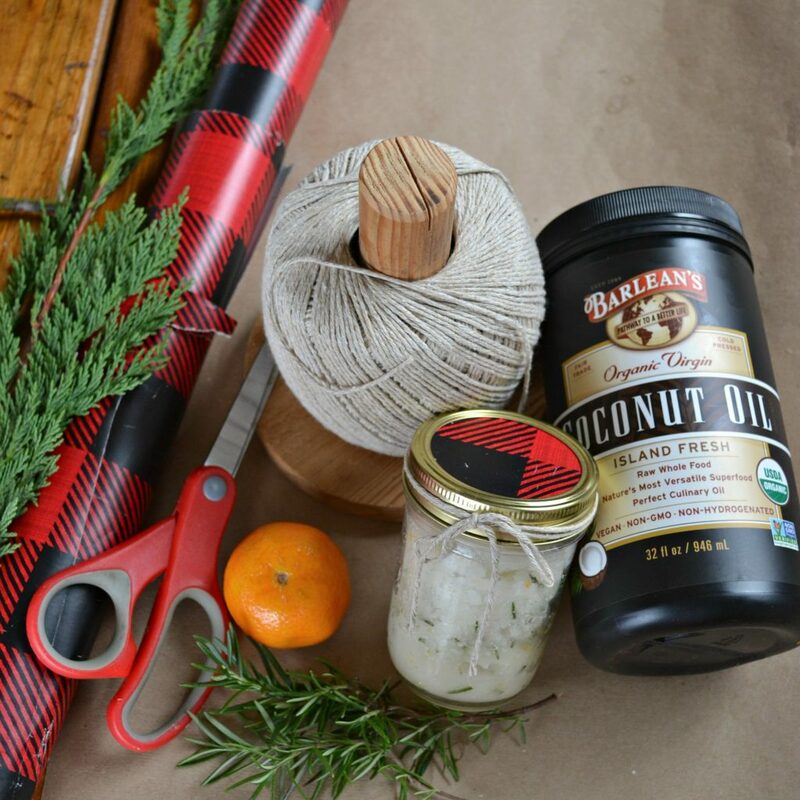 Melt the Barleans Organic Coconut Oil and stir in the sugar, rosemary and orange zest. Next, stir in a few drops of each essential oil. Decorate your jar with pretty paper, ribbon or a fun label. 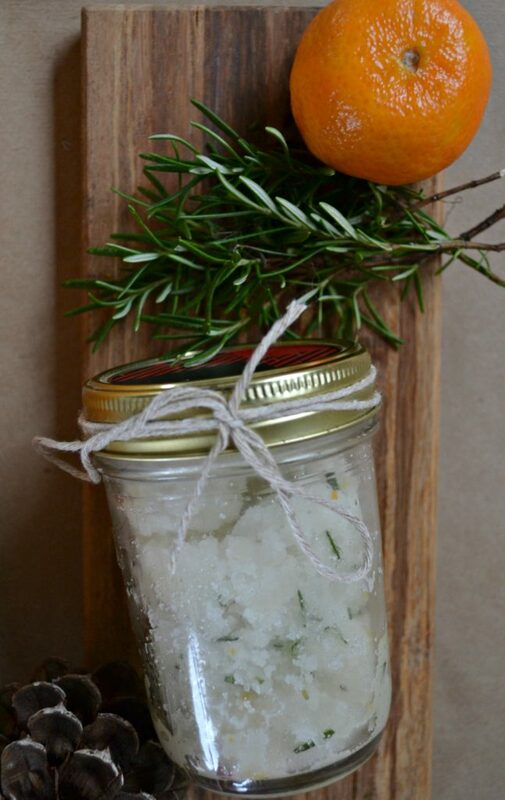 Use this sugar scrub to soften and exfoliate your skin, hands, lips, face etc. Scrub, wash away and pat dry. Makes your skin feel amazing and smells delicious. I’ve always wanted to make my own mask! I have all these ingredients too – perfect! Random ‘thunk’…does anyone worry when using coconut oil base recipes when rinsing off and it draining into our septics? Or am I overthinking? I baby our system just because I want it to outlast me, so perhaps I’m again worrying about a problem when there isn’t one…we do bentonite clay masks quite often and when rinsing off I always set a dish pan inside the sink and toss the rinse water outside! For the very same worrywart reason as above!! Any thoughts? What a great gift to give someone! And it looks so easy to make! Great share!